Never judge a book by its cover. Never judge a snack by its bag. This completely under dressed bag somehow jumped out at me while in route to checkout. I'm not sure what caught my eye, the fact that it said CRUNCHY or LENTILS. Either way the curls on the bag made my mind start to curl around what a hybrid lentil potato snack would taste like. It's like Lentil had a one night stand with Potato and BAM--> a new love child named Crunchy Curls arrived. 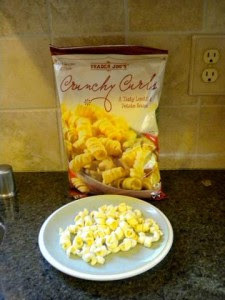 When Crunchy Curl grows up it's Facebook would headline with this picture, and flaunt about the fact that 31 of these 'better than french fries' snacks come out to only 130 calories (4g Fiber, 3g Protein). It's profile would be open to everyone and every network headlining pictures on your news feed showing off its crunchy, mildly salty, filling, and great after taste (like a french fry). Realistically, I know nothing can compete with a french fry, not even an Oreo, BUT, Myspace still competes with Facebook, and Mytouch still competes with iPhone. POINT: if its competing its worth eating. Call me skinny, but did you just get a facebook friend request from Crunchy Curls? Please don't hesitate to add. Oh my gosh, I tried these on Saturday for the first time. They are soooo good. Just watch the portion control because I could not stop eating them. These are wonderful! Satisfies my chip and/or fry craving is as much healthier. I just bought these yesterday and they are almost ALL gone! I love them! I am a health nut to the max and watch every morsel I put in my mouth. Thank you, Trader Joes, for this delicious alternative to chips. They are high in fiber so are extremely filling and have wonderful flavor. I buy 5 bags at a time and share with guests in my home. A big thumbs up!